1 Nice Craftsman 46" Zero Turn Mower With 16.4 Hours On The Clock. Offering comfort, durability and performance, the 46 22 HP V-Twin Briggs & Stratton Zero Turn Riding Mower is built with the demanding homeowner in mind. The mower is powered by a 22 HP 724cc Briggs & Stratton Platinum Series engine and features a robust 46 reinforced steel deck. A dual hydro-gear EZT drive system with easy-to-operate dual levers with foam padded grips allow you to turn on a dime. The 6 cutting heights give you the flexibility to cut like a professional. A top speed of 6.5 mph and a 3.5 gallon fuel capacity allow this powerful and efficient riding mower to cut up to 2.4 acres per hour. 16850 $1100.00 $1150.00	 login to bid. login to bid. Sold! Call us today at 816-668-1121 to learn more about selling your items! 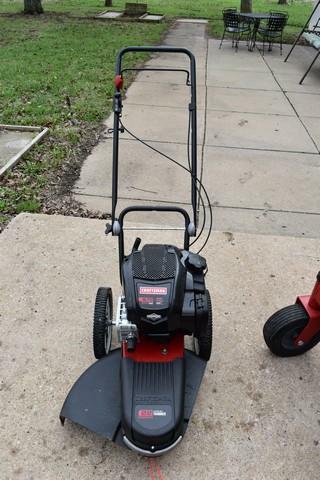 Nice Craftsman 46" Zero Turn Mower With 16.4 Hours On The Clock. Offering comfort, durability and performance, the 46 22 HP V-Twin Briggs & Stratton Zero Turn Riding Mower is built with the demanding homeowner in mind. 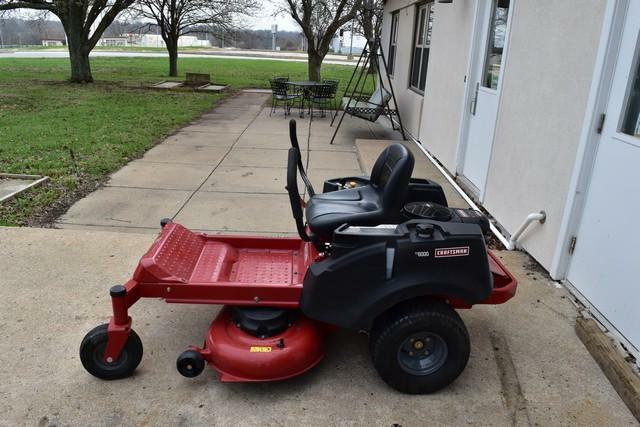 The mower is powered by a 22 HP 724cc Briggs & Stratton Platinum Series engine and features a robust 46 reinforced steel deck. A dual hydro-gear EZT drive system with easy-to-operate dual levers with foam padded grips allow you to turn on a dime. The 6 cutting heights give you the flexibility to cut like a professional. A top speed of 6.5 mph and a 3.5 gallon fuel capacity allow this powerful and efficient riding mower to cut up to 2.4 acres per hour. 16850 $75.01 $80.01	 login to bid. login to bid.